Day is slowly breaking on a March morning in the port city of Piraeus, Greece, as a burly red-headed figure stands dockside with luggage bags filled with 200 soft-sided baby carriers. James “Woody” Faircloth (’90), alongside fellow volunteers with the U.S. grassroots organization Carry the Future (CTF), waits for the arrival of ferries transporting hundreds of refugees seeking asylum. 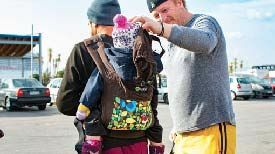 Each day the volunteers wait at the dock for the 5 a.m. and 11:30 p.m. ferries, with rolling luggage bags in tow, prepared to hand out, fit, and instruct refugee families with the donated baby carriers. That’s how Faircloth, 49, a national account manager for Comcast in Denver, Colorado, describes the scene and how he got to that dock in Greece after becoming involved with non-profit CTF only six months prior. A father of four with his own two sons, Ehret and Stowe, committed to the U.S. Army, Faircloth was accustomed to keeping a close eye on the news unfolding overseas. He was immediately moved when he saw the gut-wrenching image of Alan Kurdi, a 3-year-old Syrian refugee whose body was found washed up on a Turkish beach in September 2015. Shortly after seeing the heartbreaking image, Faircloth came across a story about CTF founder Cristal Munoz-Logothetis, a California mother who collected used baby carriers and supplies for refugee families. That night, Faircloth sat up in bed and abruptly reached out to Munoz-Logothetis on Facebook, volunteering his help. Faircloth would go on to become the CTF Colorado state coordinator and now the Midwest regional director, regularly storing up to 300 baby carriers in the guest room of his home. 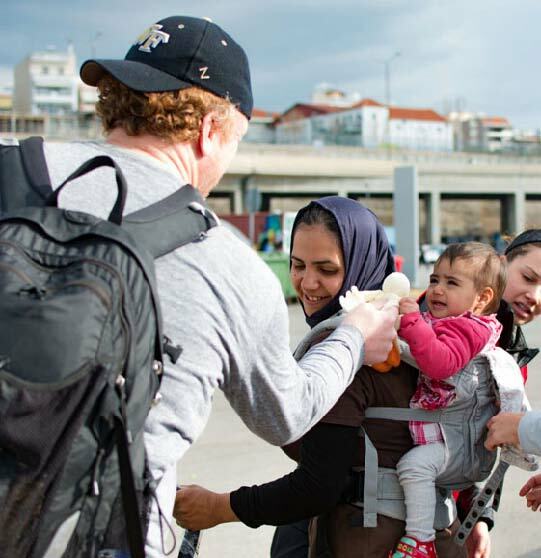 Finally, in March, Faircloth traveled to Athens, Greece, with a group of CTF volunteers who brought with them 1,200 baby carriers. 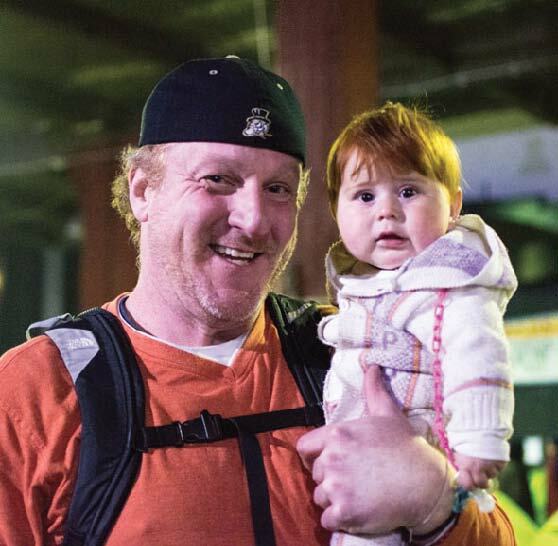 In Greece, Faircloth split his time between handing out more baby carriers dockside and assisting volunteers in the Hellinikon Olympic sports complex. 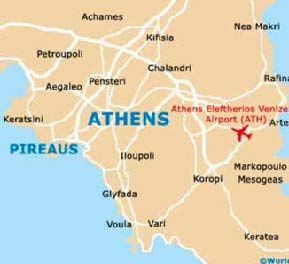 Walking around what was once the site of the 2004 Athens Olympic Games, Faircloth helped distribute relief supplies to the 3,000 refugees calling the venue home. Between volunteering at the dock and sports complex, Faircloth took the time to connect with each refugee family he met. Among the luggage bags filled with carriers, Faircloth brought with him a baby carrier that held special significance. Shortly after he began volunteering with CTF, he read about the loss of a friend’s baby, Carwyn, in utero. After reading about how the parents said goodbye to their stillborn daughter, Faircloth reached out to the couple, who didn’t hesitate to mail him the baby carrier intended for their child. Faircloth would later write a post to them, explaining the journey of this particular baby carrier, as it traveled from his home in Colorado to Piraeus. 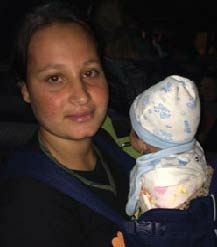 “While you were never able to get the chance, I wanted to share with you the smile of a grateful mother who is now using your carrier to carry her child to safety,” wrote Faircloth, who had fitted Carwyn’s baby carrier to a young mother, arriving via ferry around midnight with her baby, born just weeks before in a refugee camp.